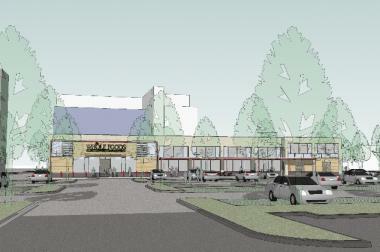 Whole Foods Market plans to open a new store in Englewood across the street from Kennedy-King College in 2016. ENGLEWOOD — A proposal to build a Whole Foods store in one of the city's most impoverished communities inched one step closer to reality Thursday when the city's Planning Commission signed off on the project. The commission approved plans for Englewood Square, a 5-acre retail development that will be anchored by an 18,000-square-foot Whole Foods store on vacant land at the corner of 63rd and Halsted streets. The Whole Foods store, set to open in 2016, will be part of the first phase of a 13-acre project. In September, the planning commission approved a 12-year extension of a local development district at the site. Martin Cabrera Jr., chairman of the commission, said extending the Tax Increment Financing district in the area would help make the project a reality. Ald. JoAnn Thompson (16th), whose ward includes the Whole Foods site, attended the commission meeting and said she is elated about the project's approval. “Too often Englewood is written about as a ‘problem community,' but [Englewood] is a strong and diverse community of homeowners and renters, workers and students," Thompson said. “Englewood Square and Whole Foods are just the kind of opportunity we have sought and can support." She added that a Whole Foods store would give residents much-needed "access to healthier food and healthier lifestyles," and also "stimulate the economy of our neighborhood by providing new jobs." John Paul Jones, president of the Sustainable Englewood Initiatives organization, said he supports the new Whole Foods store. "Look around you. There are not a lot of choices around here for grocery stores," Jones said. "Yeah, there's an Aldi down the street, but there's a lot of stuff Aldi does not carry, and that's where Whole Foods comes into play, especially if you're talking about organic products." The Aldi at 20 W. 63rd St. expanded its offerings of meat, dairy and produce this summer, representatives said.